Unrefined – is deep green slightly brownish in colour with strong aroma or pale yellow if refined is odourless. Uses: Renowned for its healing, anti-bacterial and anti-wrinkle properties, Avocado is moisturising and easily penetration of the skin, rich in vitamin A,C,D,E & proteins, revitalising the appearance of the skin, rich in fatty acid, softening.. Highly recommended to those with skin problems such as eczema, psoriasis, sensitive skin and other skin ailments. 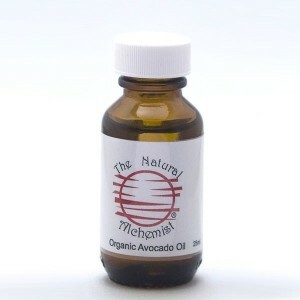 Refined avocado oil is preferred because it is odourless and is used during intensive facial treatment for mature skin. The penetrative powers of this oil is much more than other oils, thus it is ideal massage oil for skin and body treatments. It stimulates the collagen metabolism, increasing the proportion of soluble collagen in the dermis, helps in cell regeneration, retards visible signs of aging and remarkably softens the skin. Safety Data: use on most skin types, highly recommended for dry or mature skin but NOT recommended for sensitive skin.